Packs and packs of pitted dates taking over half of refrigerator lowest shelf is a common sight at our home. And why not? It is one of the best snacking items! Healthy, tasty and nutritious. We munch on them at home, in office, during hikes or whenever we want without any guilt. 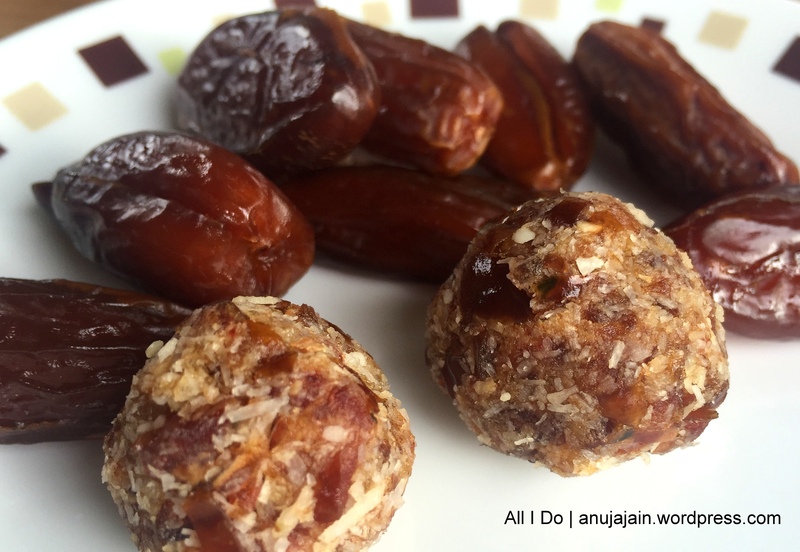 Though you can pop pitted dates right in, I like to add a lot of variation in taste, texture and nutrient value with my easy date dessert recipes. To start things off, lets begin with this extremely easy, two ingredient recipe of a healthy no bake dessert. Take out minced dates in a bowl and add shredded coconut little by little while mixing and kneading using hands. You can shape them in any other desired shape using cooking cutters too. If using cookie cutter, Make sure to add a little fattening (butter/ light flavored oil) to a smooth surface and rolling-pin before rolling out your dough to avoid sticking.